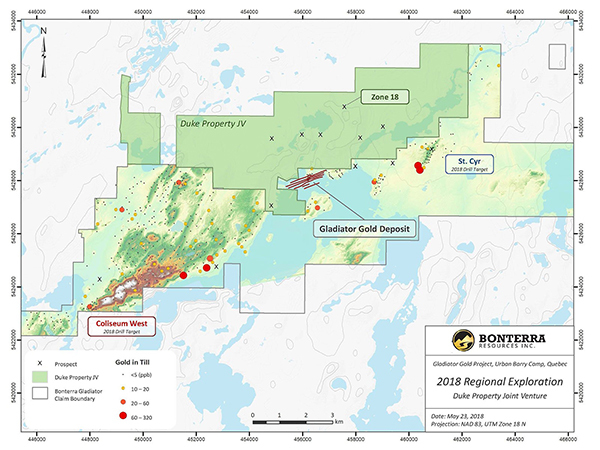 Vancouver, BC – July 9, 2018: Bonterra Resources Inc. (TSX-V: BTR, OTCQX: BONXF, FSE: 9BR1) (the “Company” or “Bonterra”) is pleased to announce that further to its news release of May 23, 2018, it has now completed and entered into an Option Agreement with Beaufield Resources Inc. (TSX-V: BFD) (“Beaufield”), whereby Beaufield has granted the Company an option to acquire a 70% interest (the “Option”) in 81 strategic mineral claims totaling 3,590 hectares, located in the Urban Barry Greenstone belt, Quebec, and known as the Duke property (the “Property”). Under the terms of the Option Agreement, Bonterra can earn a 70% interest in the Property by issuing 4,000,000 common shares to Beaufield upon acceptance of the transaction by the TSX Venture Exchange, paying Beaufield a total of $750,000 in equal amounts over a three-year period, and incurring a total of $4,500,000 in exploration expenditures on the Property over three years. “We look forward to working with the Beaufield team in fully exploring the Duke lands with greatly enhanced benefits of shared experience and open claim boundaries, as well, the potential Gladiator Deposit extensions can now be efficiently defined and expanded. Upon completion of the recently announced acquisition of Metanor, Bonterra has not only cemented its hold on a number of developing new deposits in the region, it will also own the only operating and expandable mill in the Urban Barry camp.” commented Nav Dhaliwal, President and CEO of Bonterra. The transaction is subject to the acceptance of the TSX Venture Exchange, such acceptance to be sought forthwith. This press release contains “forward-looking information” that is based on Bonterra’s current expectations, estimates, forecasts and projections. This forward-looking information includes, among other things, statements with respect to Bonterra’s exploration and development plans and proposed acquisition of Metanor. The words “will”, “anticipated”, “plans” or other similar words and phrases are intended to identify forward-looking information. Forward-looking information is subject to known and unknown risks, uncertainties and other factors that may cause Bonterra’s actual results, level of activity, performance or achievements to be materially different from those expressed or implied by such forward-looking information. Such factors include, but are not limited to: uncertainties related exploration and development; the ability to raise sufficient capital to fund exploration and development; changes in economic conditions or financial markets; increases in input costs; litigation, legislative, environmental and other judicial, regulatory, political and competitive developments; technological or operational difficulties or inability to obtain permits encountered in connection with exploration activities; and labour relations matters. This list is not exhaustive of the factors that may affect our forward-looking information. These and other factors should be considered carefully, and readers should not place undue reliance on such forward-looking information. Bonterra disclaims any intention or obligation to update or revise forward-looking information, whether as a result of new information, future events or otherwise.